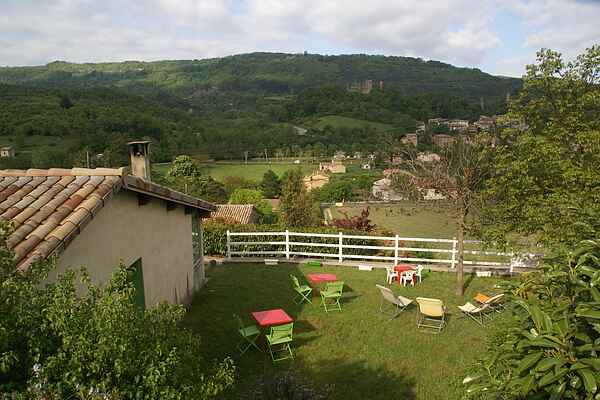 You have a wonderful view of the lavender fields from this detached holiday home in Bourdeaux, in the Drôme. This area between the Vercors and the Provence has much to offer. The grassy garden is the ideal place to barbecue, read, or enjoy a beautiful sunset. The house has a simple but cosy interioir. There is a fireplace (wood available) and a double sofa bed in the living room. A studio is linked to the house (entry from the outside), where you'll find an extra bedroom and bathroom. The area is perfect for several trips. Visit the glass-making factories in Dieulefit (14 km) or the medieval town Le Poët-Laval (20 km), where a beautiful twelfth century castle is waiting for you. Want to visit an extraordinary museum? In Soyans (14 km) you can admire all kinds of eggs and nests in the egg museum. Of course, there are more towns in the vicinity where you can shop and lounge on a terrace. France's highest castle tower is in Crest (26 km). This tower has a turbulent history. The Château des Adhémar near Montélimar (46 km) is a prime example of medieval architecture.